Title: 10/09/1987 - Clarification of Material Safety Data Sheet Requirements Under the Hazard Communication Standard. SUBJECT: Clarification of Material Safety Data Sheet Requirements Under the Hazard Communication Standard. 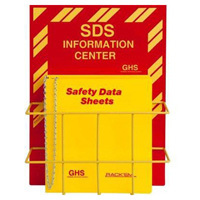 The following clarification relates to the Material Safety Data Sheet (MSDS) requirements of the Hazard Communication Standard (HCS), reference 29 CFR 1910.1200. Paragraph (g)(3) of the standard requires that chemical manufacturers, importers and employers preparing a MSDS include explanatory statements in blank sections. Accordingly, preparers must mark blank sections with any words that convey the idea that the information was not applicable or not available. The duty imposed under paragraph (g)(3) of the HCS has raised the question of whether a preparer can simply exclude a block from the MSDS rather than making an explanatory note? Based on an interpretive reading of the standard, blocks or sections may be omitted in their entirety if no information is available or non-existent. If you have any question regarding this clarification, please contact Roy Gibbs or Steve Simon on FTS 523-8036.